HyperMiata LIVE in under an hour at THIS LINK. Going in this year the tactics were very different than last. Last year this was the new build that might shake up the field. This year was about seeing how far I could drill down closer to the class record, and my goal was to grab the one thing I missed by 6 hundredths of a second last year; the overall Limited class win across all drivetrain layouts. Every car in Limited was a competitor for us. The GTRs, Evos, STIs, Porsches, everything. This year we had to work for it a bit, but the stoke was through the roof beginning to end. 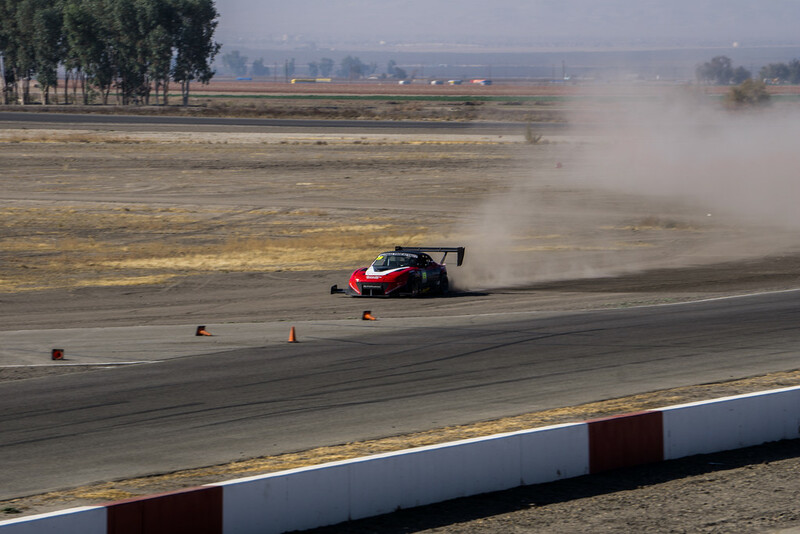 Having shredded 5th gear during the shakedown just days before the event I was working down to the wire to swap to the backup trans before Superlap, but we got things buttoned up and I even had a good night’s sleep before the tow out to Buttonwillow. We started right out of the gate with working through some stuff. On the first session of the day I lost two of the strakes in my splitter. Thanks to the lessons learned at VIR I brought spare material in the trailer so I cut new strakes out of aluminum, bent them over the tool box edge and gorilla epoxied those into place, plus a couple self-tapping screws (something I would never use in building the car but suddenly completely acceptable for a track-side fix). Those new strakes held for both days. On an LFX related note, I had got sick of being unable to remove the driveshaft without dropping the diff or engine so while the trans was out I cut the flanges off the transmission tail shaft and the centering pin off the differential’s flange. This means the driveshaft has to be manually centered. Early on day 1 there was a lot of vibration coming from the driveline. We got under the car and re-centered the driveshaft and that fixed things. By the third session I was down to a 1:48.1. 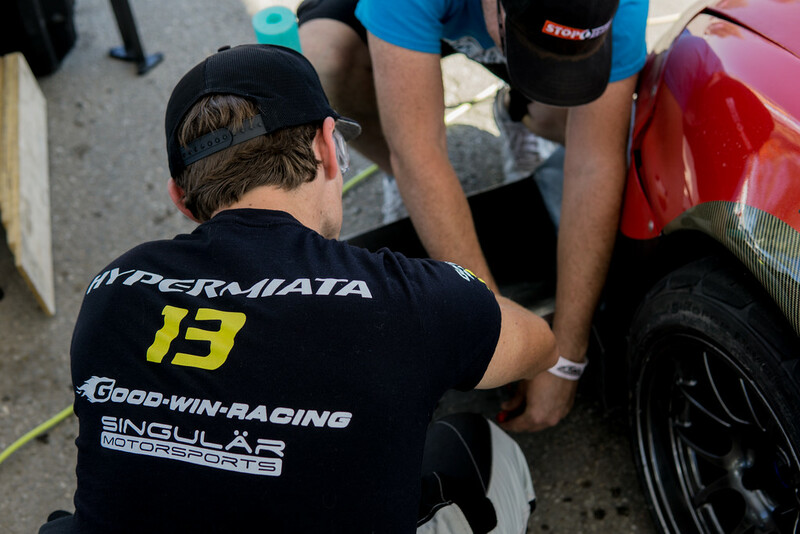 Six tenths off my PB, but discussions with a lot of other teams and drivers revealed everyone felt that the track was slower. Various theories about why but ultimately you just get out there and wheel it, make tweaks to find the most speed you can, and the times are what they are and you see how you stack up with everyone else, so that’s what I set my mind to. Last session of day 1 I had a brake master cylinder failure, no pedal going into cotton corners. Kept it on the track and tip-toed back to the pits. I had another MC in the spares bin, the challenge was bench bleeding it with what we had on hand. Thanks to John (Supermiata), Andrew (TSE) and Moti (BFW) for contributing ideas to come up with some McGuyver ways we might be able to do it. Took a while, made longer because it was in near-freezing temps but had the MC in and bled by 11pm. Big thanks to our team member Greg for sticking it out with me in the cold to get it swapped and bled. The next morning drove around the paddock at 7 AM, pop bled it again, then bled again after 1st session and the brakes were ready to rock for the rest of the day. Fresh tires on for day 2. 1st session of day 2 was a mess with a bunch of the Unlimited class cars going off due to either failures or trying to push too hard. This caused some chaos with the restart and the flaggers weren’t communicating with each other well, so I had a near-incident with the Savvy Motorsports Porsche GT3. I was on a green flag flyer, he thought we were still under yellow. He was weaving to warm up tires as I approached at probably >60mph closing speed, he weaved left off-line which I mis-read as he saw me and was getting out of the way, then at the last moment he weaved right again in front of me. I wasn't going to stop in time so I aborted right and sent it into the dirt. No harm done to the car, good place for an off. It's always the lap that feels best when something like that happens. Hoping we got the chaos out of the way with that session we dug in to finding some more time in the later sessions. Set a new PB with double 1:47.3's. After session 2 I wanted a little more front end bite so Moti and I cut and installed some gurneys on the splitter. That worked but almost too much with things getting loose at high speed so we added 2° of rear wing and a click more low speed compression in the front shocks for the final session. I also went into the trailer and just closed my eyes and went through laps in my head for the last 15 minutes before the final session. First hot lap of the final session showed a 1:46.95 on the AIM. Too close for comfort; sometimes the track timing doesn't agree perfectly with the AIM and I REALLY wanted that official 1:46 so I did a cool down lap to really baby the tires and then went for another one. AIM said 1:46.599, I was fist pumping in the car. Low on fuel so I pulled into the pits and got my high five hands ready for the whole crew. Official timing said 1:46.8, I'll take it. Only later did we find out that Amir in the V8 M3 (600+hp) went 1:47.2 in that session, which would have taken the win from us if I hadn't done the 46. 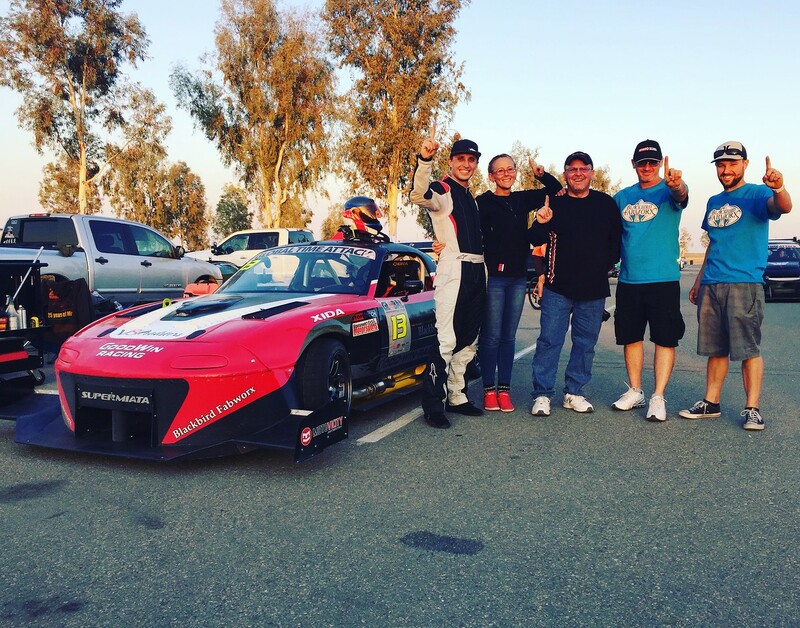 Final results: 1st in Limited RWD and an overall win across all Limited class drivetrains! Data from the lap shows some ridiculousness for street tires. As in, it looks like I’m on 275 Hoosiers. The aero package is really strong. I’m continuing to improve the chassis setup, the brakes are stellar, and the more I race and dial this car in the better it gets. There’s more to come. I want to thank every single person who tuned in to the live feed, followed along on Instagram/Facebook or kept tabs in the forums. After the dodge with the Porsche on day 2 a bunch of people reached out to make sure things were OK which was really cool. I’ve said it many times before and I will continue to; when we’re out there dicing with Goliaths it really feels like we’re racing for an entire community of friends and enthusiasts behind us. Each of you are a part of what motivates me to push forwards. Where to now? That Limited RWD record is still out there! The gap is down to 2.255 seconds. The current record was set before the rules slowed Limited class down, but I really believe we’re on the way to resetting it despite that. I have more plans on the drawing board that I didn’t get to this year, so there is more coming soon. Would like to see this same car with a K24 2.7L stroker motor in it. Wonder if you could see similar reliability on the stroker if you limit the rpm. Well, take it from someone who has done a lot of racing with the turbo - it puts off a LOT of heat. I've melted just about every plastic or rubber part on the driver's side of the engine bay at one point or another! That heat also affects the motor in a lot of ways. Some might notice we don't sell a turbo kit for the 1990-2005 cars. That's because there isn't a kit on the market we feel we can endorse; there's a laundry list of changes that need doing to just about every kit out there to have a hope of running reliably under hard use. This car got there, but it took half a decade of custom revisions and improvements to get there. At the end of the day you can't get away from the fact that when you're asking a motor to put out 100-200% MORE power than it was originally intended to, longevity is not its strong suit any more. And that brings us here: the search for a great motor pairing for the car that was designed from the beginning to make all the power we want, which should make for not only a faster car but also a more reliable one. This seems a little disingenuous to turbo cars in general. The most glaring issue I have with this is that it makes it seem like all turbo cars would be bad track cars, which isn't even remotely true. The other issue is that there is ALWAYS ways to dissipate turbo heat. Off the top of my head you can do heat shielding, turbo blankets, larger radiators, careful coolant routing, turbo relocation, hood ventilation, and, if your desperate, a cooling duct specifically for the turbo. I've been looking into ways to cool my turbo between laps at the track and most of the time popping the hood and taking a 10 minute break does the trick, and that time has decreased since I rerouted and insulated some of my coolant lines. I haven't even got to ventilation or heat shielding yet. Finally, I am more than willing to switch out a "plastic or rubber part" if it means adding 200% more power with only 50 lbs weight added. Your results are freaking impressive, but I can't help but feel like you could improve even more by switching to an aluminum block turbo 4. I don't disagree, I have been there and done that and there are absolutely ways to make a turbo car survive on the race track. 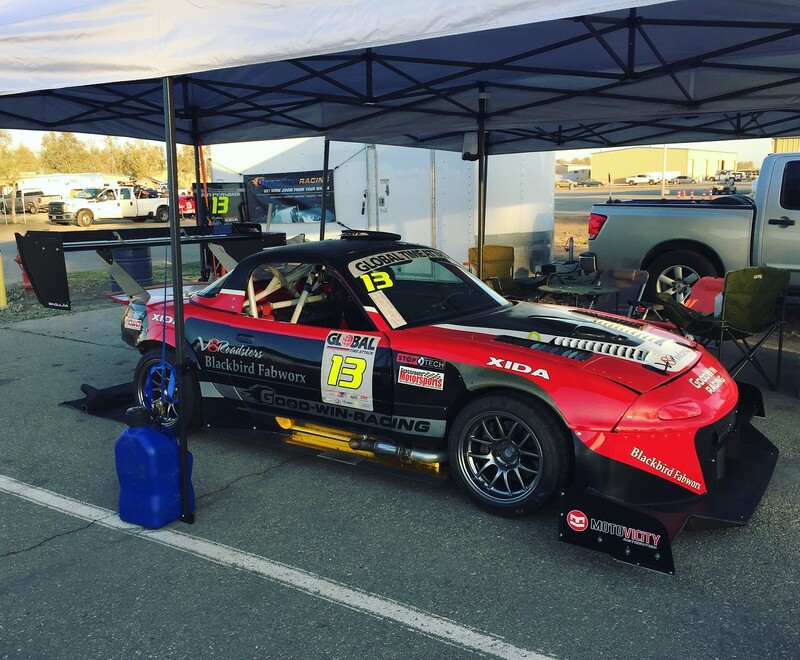 After all, turbos are extremely common in professional racing where the budgets are big and the resources to design everything from scratch with exotic solutions are there. But as you say, there is a lot of work and a lot of elements that need to be done right to get it there. I'm a huge fan of turbos. Love them. But the LFX needs none of that, it churns out power equal to a fully built and turbocharged BP with a torque curve the turbo can't hope to match, and it does it without needing a single special consideration... and I gotta tell you, that's been quite nice. This has been a season to remember. 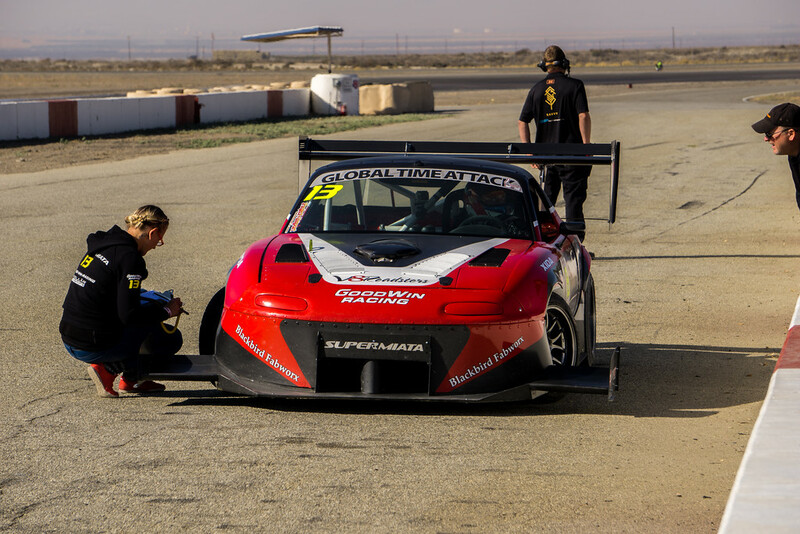 In March we set the Modified Production Car Lap Record for Chuckwalla Valley Raceway CW. At GTA Round 1 we took 1st place and top time across all drivetrains for Limited. At VIR the unfortunate contact with the wall set development back about 150 hours, but it also offered me an amazing opportunity to learn from the Supermiata crew as we thrashed to get the car back into running shape and made it out to set the 2nd fastest Miata lap of that track ever. 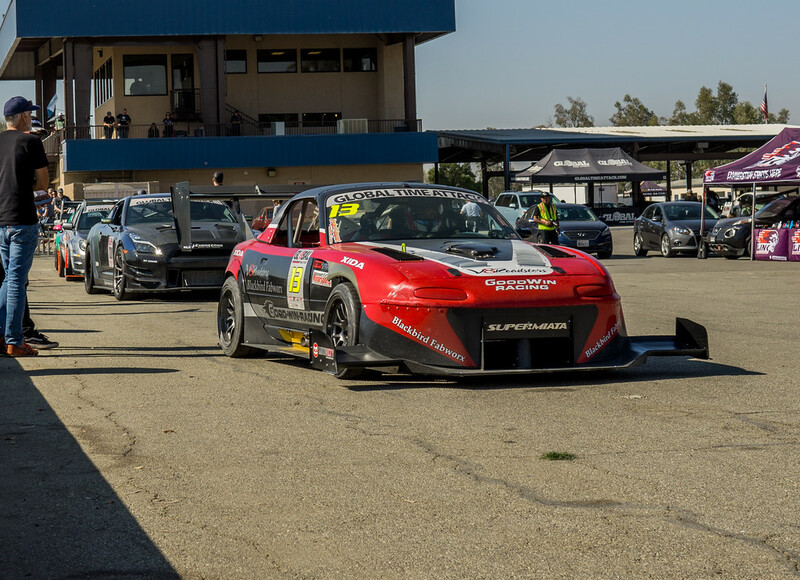 GTA Round 2 fell just one week after the car arrived back in CA wounded from VIR. It took some long nights but we didn't just make it to round 2, we took another 1st place and top time across all drivetrains for Limited. At GTA Round 3 we cinched the season championship with another identical result. We've come incredibly far, and we've reached this point by setting big goals and working towards them. I want to continue to seek big challenges to drive us to improve. I’ve been thinking about this a lot over the second half of this year; where do we go to push ourselves to the next level? 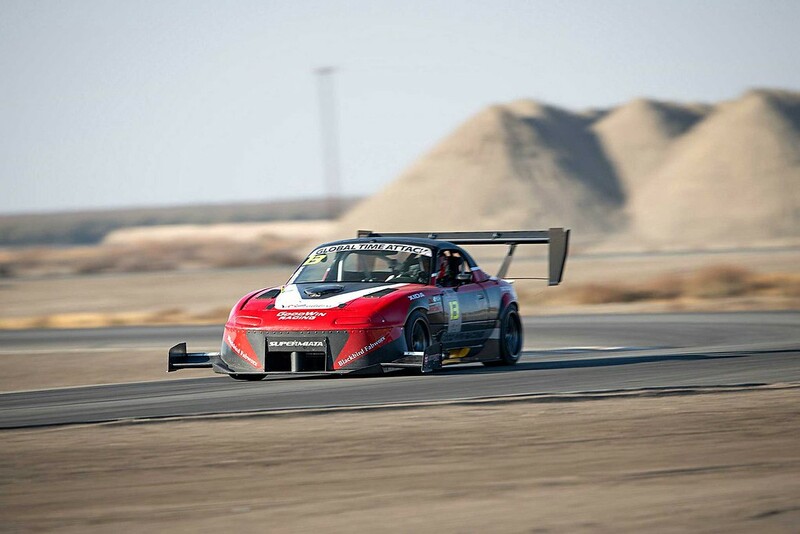 With excellent timing, at the driver's summit at SEMA the GTA series announced very exciting changes for the future. 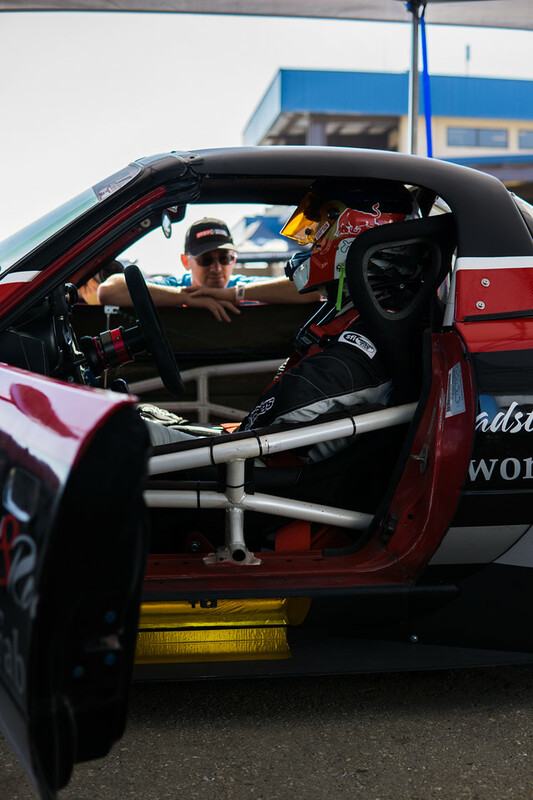 Inspired by and working with World Time Attack Challenge in Australia, GTA is evolving to focus on one new "superbowl" US event. 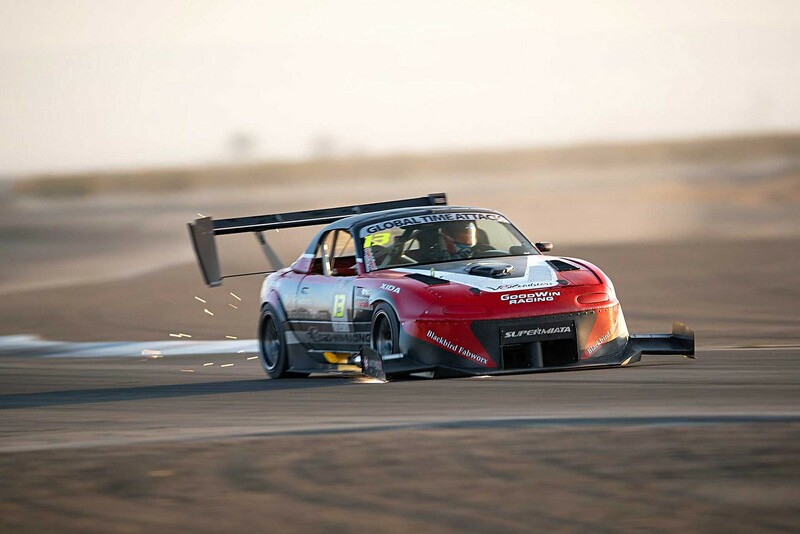 This new Superlap Battle USA is to be held at Circuit of the Americas with a rule book tweaked to facilitate cross-over with WTAC cars from Australia, Japan, and more. 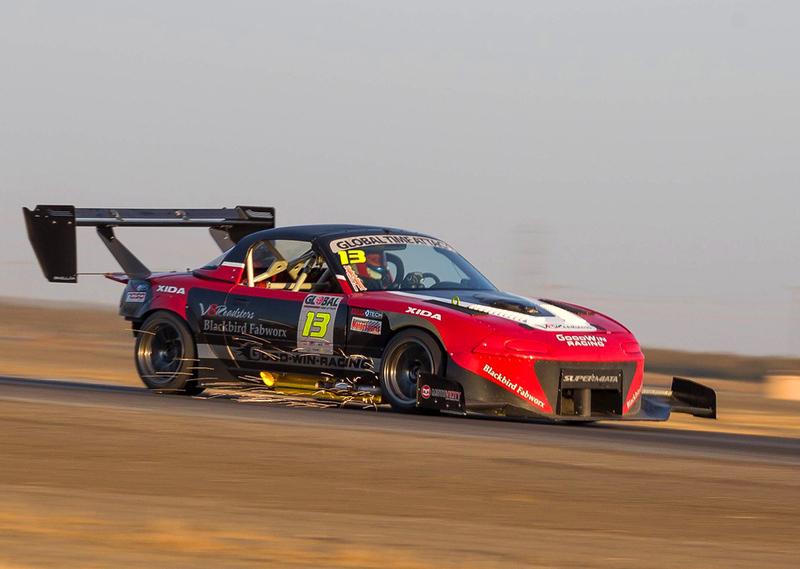 Besides that event, there will be just three Pro series events on the calendar (two East Coast events and Buttonwillow remains as the season finals in November). At the driver's summit at PRI they announced a joining of forces with other organizations to form the North American Time Attack Council, creating a new driver licensing structure and a new series hierarchy where SCCA serves as the club level entry point to time attack feeding drivers up the ranks into GTA as the premier Pro level national series for North America. The presents us with big new challenges. 1) COTA is a big horsepower track. We're the best on the brakes and in the corners, but GTRs can bring 1000hp to the fight and at this track with tons of room to use it that will be a massive advantage for them. 2) With the new spotlight on an event bigger and badder than ever, it will draw larger teams and budgets. Further to that point, with a chance of international teams making the trip over by 2020, competition is going to escalate to a new level. 3) Classes have evolved for 2019. 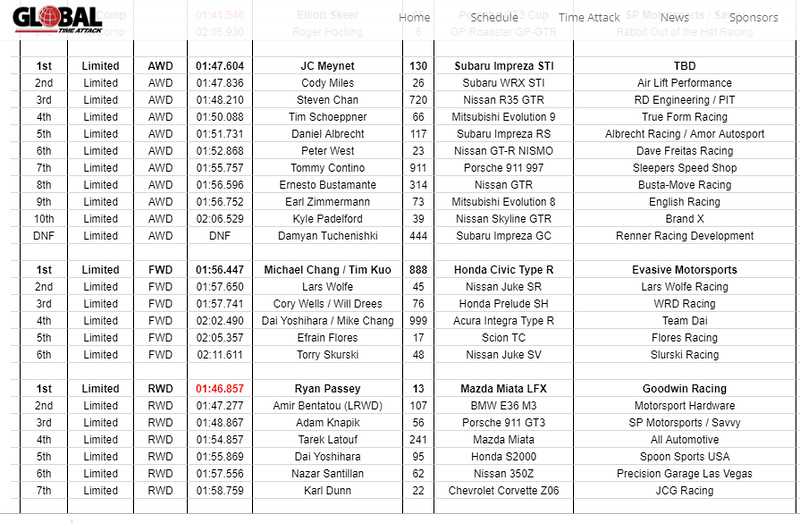 Similar to WTAC, there will no longer be any division by drivetrain layout. It's now just Enthusiast, Street, Limited, Unlimited. This means large fields. In the past we considered every Limited class car a competitor, now it's official. SLB USA 2019 is just around the corner, Feb 14. Very little time to make changes. GTA is planning 2019 to be a building year with 2020 bringing international teams, so we’ll take a similar approach; get to COTA this year with the car largely as it is now and use what we learn there to guide development through the rest of the year, building towards the big leagues: COTA 2020.